Nigeria has been acknowledged as one of the largest resource rich economies in Africa with an evolving political system. Although the country is currently experiencing some economic challenges, the leadership is working relentless to set to overcome them and set a positive tone to prospective investors through targeted policies. Majority of the policies are geared towards eradicating corruption, transforming the agricultural sector, diversifying the economy and providing an enabling environment for private sector operators to flourish without encumbrances. At the international Anti-Corruption Summit organized by the government of the United Kingdom, the President reaffirmed his commitment to strengthen anti-corruption reforms through implementing programs aimed at: exposing corruption; punishing the corrupt and providing support to the victims of corruption; and, driving out the culture of corruption. Flowing from these commitments, the Federal Government sought to deepen institutional and policy reforms. This led to Nigeria joining the Open Government Partnership (OGP) in July 2016 as the 70th country. Government financial and budget information should be transparent and made easily accessible to all Nigerians, and allow active citizen participation on Government spending, monitoring to ensure implementation of Government projects. This will boost citizens’ trust, improve effectiveness of the tax system, and improve Nigeria’s ranking on the World Bank Doing Business Index. A platform for sharing information among Corruption Agencies, Law Enforcement Agencies and all stakeholders should be established to strengthen Nigeria’s asset recovery legislation. This platform will ensure a collaborative effort between all anti-corruption agencies in the country’s fight against corruption; improve integrity, transparency and accountability. Nigerian Citizens have the right to make enquiries about their government and the utilization of the country’s resources. 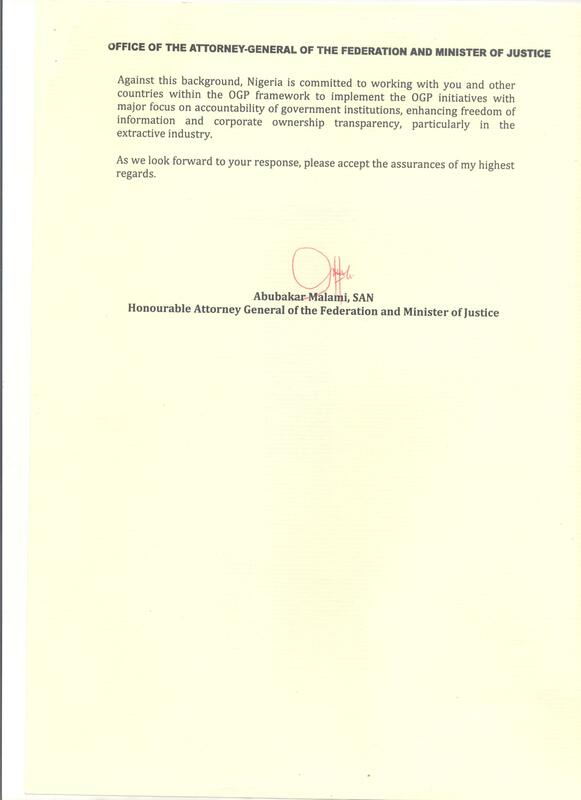 They must have easy access to all information which should be made readily available on request, with respect to the Proactive disclosure provisions and improved Freedom of Information Act. Nigerians should be given free and open access to all Government information they need, and allow them the opportunity to interact and actively participate on government policies, projects and how they are governed. A technology-based mechanism for citizens’ recommendations and feedback on transparency, accountability, and good governance should be adopted. This will build mutual trust and confidence between government and citizens. The commitments are concrete, ambitious but implementable. Some of the key deliverables are open budgeting, open contracting, revenue transparency, and a publication of a register of beneficial ownership especially in the extractive industry among others. They draw from the issues Nigeria has committed to during the Anti-Corruption Summit in London in May 2016 and aim at consolidating ongoing efforts over the next two years. 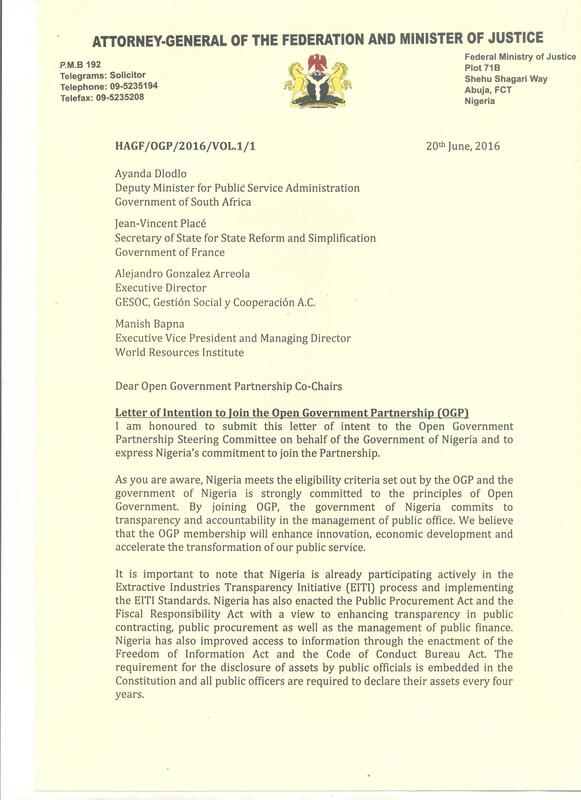 The following letter was submitted by the government of Nigeria, declaring their intent to join OGP.